One thing that always makes me feel like a lady, is having my nails done. It’s like the addition to the perfect outfit, a detail that never goes unnoticed. I used to get acrylic nails to follow the stiletto nails trend until my nails became brittle and damaged. Following in the foot steps of my no heat challenge (post coming soon), I started a no fake nails challenge in a effort to strengthen my nails! I went back to gel nails and my manicurist told me that they were now even too weak for that. Familiar with those white lines and bends after a “take off”, so was I. So normal manicures it was, but I needed them to last longer than the average nail polish because trekking back and forth to the salon was not happening. How can a manicure stay fresh? (because we all know how instantly regular manicures can chip) That question lead me to Essie’s new Gel Couture nail polish, that lasts for almost two weeks and stains like gel. Since then my nails have gotten stronger, and longer! 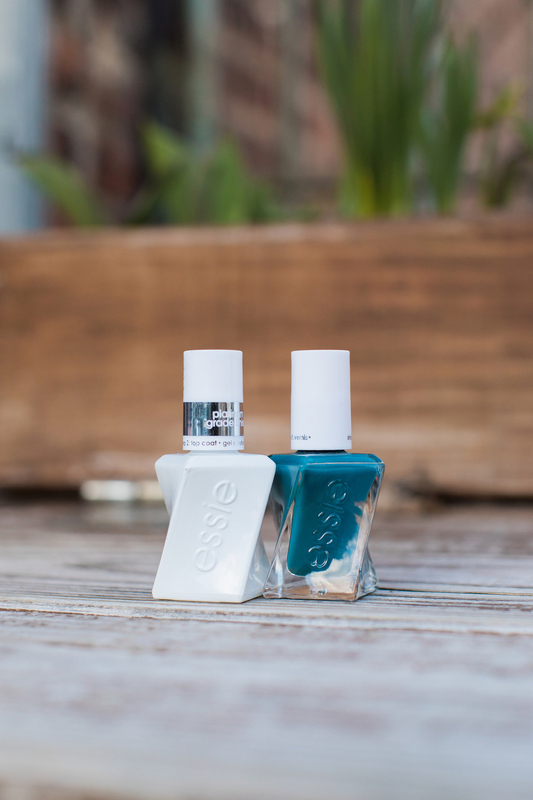 Essie is right on trend and is releasing this line in all the newest shades, especially Spring colors! Just in case you missed it I shared this entire look in my newsletter, but you can shop similar white booties using my styling secret here! This color is the perfect marriage between grey and purple and happens to be this years hottest color, according to Pantone! A moss green looks good on various skin tones and is subtle and chic. This is a perfect work ready fashion color. Burgundy for Spring, for those lovers of dark colors who want a softer tone for Spring. I normally visit my local salon to get my initial manicure, however you can paint your nails with these shades at home too! These colors are $11.50 a bottle, but they are worth the price tag for the on-the-go woman who needs to look crisp at every turn. For at home nails, feel free to grab the official top coat, but you can use any clear coat as well. A quick application and you’re good to go! For my readers who live in New York City or Philly, these are my favorite salons to frequent. I only share products or services that I tried and as I explore more, I’ll be sure to keep sharing. If you’re not in the area, you can check to see if your local salon uses a specific color Essie Gel Couture polish with their store locator (genius)! With 3 salons in the Brooklyn area, the feel of this salon is very upscale and will leave you relaxed and unbothered. You can sip tea while in the pedicure chair and get intense massages afterwards while your nails dry. A great place for a girls day out or special occasion, this black owned salon has an enjoyable aura and the also offer wine! You are in for a great time. The only nail salon that I ever visited in Philly once I found it, Mingle is on trend or even trendier than what’s new and they too offer bubbly. If you are looking to be up with the nail Jonses, this is the place to go. A FRESH MANICURE MAKES ME FEEL… Powerful as said by the amazing Laverne Cox! What shade makes you feel powerful? I like to keep my nails a bright but in season color – something fun for work and long days!! !